Dr. Lo shows what the forceps look like. Imagine you are in labor and you’ve been pushing for hours. The doctor brings up the idea of using forceps or a vacuum to deliver your baby. Did you imagine horror music and picture metal instruments attached to your baby’s head? If so, take a deep breath. It’s not that scary. Operative vaginal delivery – which includes the use of forceps or vacuum – isn’t used very often anymore. According to the National Center for Health Statistics, the number of babies delivered by forceps or vacuum extraction in 2013 was only 3 percent. Meanwhile, 32 percent of births in 2013 were delivered by cesarean section. 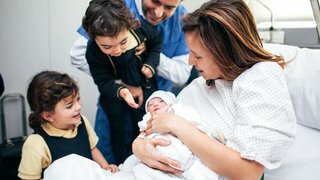 That one in three babies is delivered by C-section is a pretty startling concept, and some of those surgeries may have been avoided if physicians were more experienced in operative vaginal delivery. These methods – particularly forceps – are a dying art form. Few physicians coming out of training know how to use them or are comfortable using them. But as we become more concerned with the rising C-section rate and related complications, there’s been an effort to revive physician training in the use of forceps and vacuum extraction. 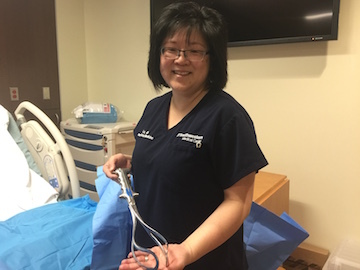 The American Congress of Obstetricians and Gynecologists(ACOG) in October 2015 affirmed the use of forceps and vacuum as a way to safely avoid some C-sections. The use of forceps or vacuum during delivery needs your consent. To help you avoid having to make a stressful decision during labor, let’s take a moment to learn more about when these methods might be beneficial. How do forceps and vacuum work? Forceps and vacuum extraction function in much the same way: they both guide the baby out of the birth canal during delivery. We do not really pull the baby out, but help direct the baby while you push – we still need your help! Before we perform an operative vaginal delivery, we make sure we know the position of the baby’s head, that your bladder is empty, and that you have adequate anesthesia on board. Forceps look a little like oversized salad tongs. We gently slide one half along one side of the baby’s head, and repeat that on the other side, so the device cradles the baby’s face. During the next contraction, we’ll ask you to push and use the forceps to help guide the head out. The vacuum looks and acts like a suction cup. We place the cup on the baby’s head – not on the fontanel (or soft spot), but on a portion of the skull – and use a pump to create suction. Just like the forceps, we then use the vacuum to guide the baby’s head out as you push. When might forceps and vacuum be used? 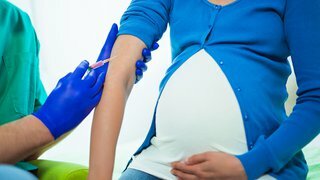 The baby just isn’t coming: For first-time moms or women who are making their first attempt at a vaginal delivery, we typically allow two hours to push if you don’t have an epidural, and three hours to push with an epidural, before we consider intervention. Women who have had children previously have one hour to push without an epidural, and two hours if they’ve had an epidural. Mom is exhausted: Labor is hard work, and the longer it goes on, the harder it is to keep up the effort. If a mother tells me, “I’m so tired. I can’t keep pushing,” she may just need a little assistance to finish the job. Baby’s heartbeat indicates a problem: If we become concerned about a change in your baby’s heart rate pattern on the fetal monitor, a quicker delivery may be needed. 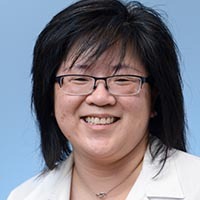 Mom’s health history: For a small number of women with certain medical conditions like some cardiac diseases, we may want to shorten the amount of time you need to push. We can’t accurately determine the position of the baby’s head. Your baby’s head has not moved down very far into the birth canal. Your baby has a condition that affects the strength of the bones or a bleeding disorder. We are concerned about the size of the baby not fitting through your pelvis. And as an FYI, forceps or vacuum also may be used during breech deliveries or C-sections to help deliver the baby. What are the benefits and risks of using forceps and vacuum? The main advantage to trying an operative vaginal delivery is it could save you from having major surgery that you may not need. A second stage C-section is more difficult and complex than when it is performed earlier in the labor process. The baby’s head, which is now wedged in the birth canal, may first need to be pushed up so the baby can be delivered through the incision in the uterus. Second stage C-sections also come with higher risks of bleeding and infection. Sometimes a baby’s head is not positioned so it’s coming straight out, but instead is cocked to the side, making it more difficult to pass through the birth canal. We may be able to correct the head position with the forceps. It’s amazing how some simple maneuvers can correct the position of the head; some moms can even push from that point forward without the assistance of the forceps. Using an operative vaginal delivery method also may result in a faster delivery for your baby than a C-section, which at times is really important. Women can give birth within minutes with the use of forceps or a vacuum delivery, but with a C-section, a woman will need to be taken to an operating room, positioned on an OR table, and have adequate anesthesia in place before undergoing the surgery. What questions should you ask your physician? 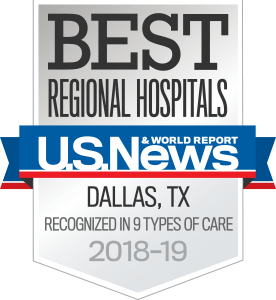 I recommend discussing operative vaginal delivery methods with your physician during your prenatal care, so you have all the information you need before you’re asked to make a decision in the heat of the moment. Ask your physician how comfortable they are in using the forceps or vacuum. For instance, I am very experienced in using forceps, but I do not have training or expertise in using a vacuum extractor. Some physicians prefer one over another, and some prefer to go straight to a C-section. These are procedures in which the skill of the physician matters, and it’s important they not attempt it if they can’t do it. While making a birth plan, you can learn about your delivery options and let your physician know what you are comfortable with. I have patients who desperately do not want a C-section, and while I tell them that we will do everything we can, sometimes events dictate that we can’t safely use the forceps or vacuum to deliver vaginally. I am always a little sad when someone’s baby is too high in the birth canal to even attempt using forceps and I have to resort to cesarean delivery. But the safety of the baby and mother is our top priority. I also have patients who tell me they prefer to not use forceps or vacuum. In those cases, I tell them that I also prefer to not have to use these methods, but I explain the situations in which they may be beneficial. 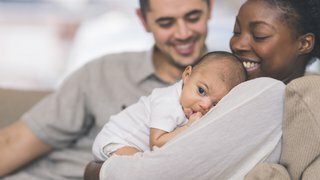 You need to have accurate information to weigh the risks of a possible operative vaginal delivery so you can make a decision that is best for you and for your baby. Talk to your physician about each option well before you are in labor. If you have questions about delivery options, request an appointment with one of our Ob/Gyns.